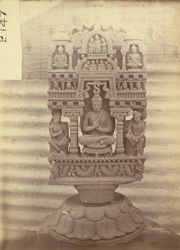 Photograph of a Buddhist sculpture from Loriyan Tangai taken by Alexander Caddy in 1896. The sculpture in this print illustrates the story of the 'Miracle at Sravasti' when Buddha was challenged by heretics and unbelievers to provide evidence of his miraculous powers. The piece is shaped like the purpose-built pavilion provided for Buddha by King Prasenajit. During his demonstration the Buddha performed a number of miracles including manifesting numerous versions of himself stretching up to heaven, making a mango tree grow instantly from a seed and preaching in mid-air sitting on a lotus. This style of sculpture, influenced by Graeco-Roman elements, is known as the Gandharan style and takes its name from the ancient kingdom of Gandhara (Peshawar) which, together with Udyana (Swat), corresponded fairly closely to the northern part of the North- Western Frontier Province.